Where the Inuit lived it was very cold so they had to make warm houses and clothes. One house they made was called an igloo. An igloo was like a mini dome made of ice and it effectively kept the warmth in. Another house the Inuit's had was called a sod house. A sod house was like a cave but on the side of a hill and it kept the wind from blowing in their home. The final house they have was a tupiq. The tupiq was a tent made of sealskin and wood, they would only use this house in the summer time. The Inuit had to also find new ways to get food because there was not much food in the arctic. Their main food source was ice fishing. They would make a hole in the ice and fish and that brought in a lot of food. Another main food source the Inuit's had was seals and walruses. The Inuit would carefully shoot the seal or the walrus with a bow and arrow. The technique of hunting was very dangerous a lot of people died shooting walruses and seals. The Inuit would not just eat the meat and leave the rest. The Inuit would use everything that they shot, even the bone. 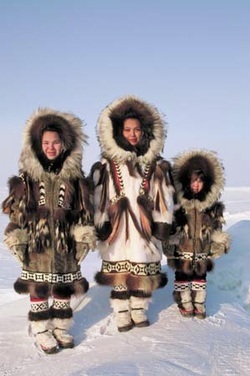 The Inuit had to get extremely warm clothing for the winter and they found the perfect material. They would stuff fir in between seal skin and the fir was warm and the seal skin was waterproof. Another thing they would wear in the winter was a parka. A parka was made of fir and it would go down to your shins and it had no zipper. Mukluks and gloves were made of small animal skins and they would keep the snow off of them so they would not get frost bite. In the summer the Inuit would wear tunics made of bird skin, it was still warm but not too warm. To show that your family was wealthy you would wear caribou hide with lots of beads on it.